This is my miserable supply of breast milk from yesterday 3pm until today 9am. 11.45pm (2oz), 3am (few teaspoons but I still collected that few drops anyway), 9am (2oz). 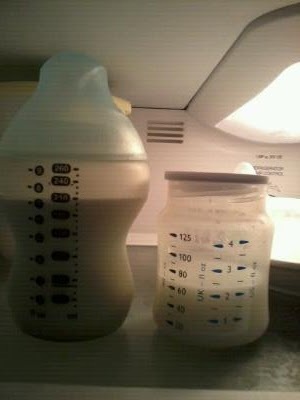 My breasts somehow could only give me maximum 2oz for each pumping session, no more than that. Only enough for Gavin's feed for daytime only. Once the sun sets, he will be on formula until the next morning. Meanwhile I will be busy pumping and storing pathetic drops of breast milk every few hours for the next day's stock. Yep, here is my precious gold drops of breast milk. 9oz in 18 hours. Pathetic? You bet.